They have been named the Baigong Pipes since they are found on and near Mount Baigong near the City of Delingha in the heart of China. Archaeologists and other researchers that have studied this phenomenon agree that the pipes, which protrude from the ground, from the side of rock walls and are even found under water, are “out-of-place” artifacts from an ancient past. They suggest either an ancient intelligent race that preceded humans by an estimated 100,000 years or were the product of alien intervention. Some have even attempted to write off the pipes as an abnormal but “natural” phenomenon that makes them appear to be man-made. Adding to the mystery is a 200-foot pyramid-shaped structure that can be seen near the mountain’s summit. This odd part of the mountain also appears to have been artificially made, although years of natural weathering puts a question mark on this. 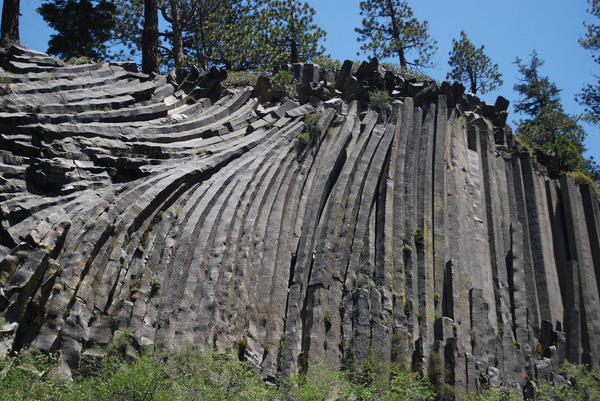 Some think it also might be a “natural” rock formation that appears suspiciously man-made. The pipes were only recently discovered by outsiders but local natives say they have known about the pipes for centuries. The local legend credits extraterrestrial visitors for placing them. Some modern researchers may think the local legend is as good an explanation as any other. Bai Yu, a Chinese author, discovered the pipes, the pyramid and what he believes were artificially manufactured caves cut in the mountain in 1996 while traveling through the area. Two of the caves were collapsed. Yu wrote that he entered a third, open cave with a triangular opening six-feet in width. Inside he found what appeared to be an array of metal pipes, with hollow centers. The pipes ran through the cave and protruded from an exterior wall. The pipes appeared to run to Toson Lake some 260-feet away. Yu noticed a large flat nearby basin that he theorized might have been used as an alien landing field. He suggested that some kind of settlement once existed at Mount Baigong and that the pipes were used to bring water from the lake. Analysis of the pipes show that they were made mostly of iron with a 30 percent mixture of silicone dioxide and a hint of plant material mixed in. The material has been estimated to be up to 150,000 years old. One report says dozens of pipes have been found protruding from the rocks far above the caves, suggesting that holes had to have been drilled so they could have been place in the rock. But for what reason? The pipes are found in various sizes, ranging from 15 inches in diameter to what has been described as “toothpick-size” at the thinnest. Because this discovery is located in a remote area in the heart of China, and consequently few researchers have been knowingly present to make further examinations, there is little more to report at this time about the Baigong Pipes. The government allegedly agreed to dispatch a team of scientists to study the pipes but to date, there has been no news of the findings. Modern killjoy researchers who claim to have examined the pipes are now saying the so-called “pipes” are in fact the result of a rock formation that occurred over tree roots. They suggest that “overflow” from a now extinct lake carried roots in piles which formed what appear to be layers of standing pipes. They don’t explain how all that rock was formed out of mostly iron and silicone.